With Opening Day on the horizon, the Red Sox continued to trim their roster, announcing six more cuts from big league camp. Left-handed pitchers Henry Owens and Brian Johnson as well as right-handed bullpen arm Heath Hembree were optioned to Triple-A Pawtucket. 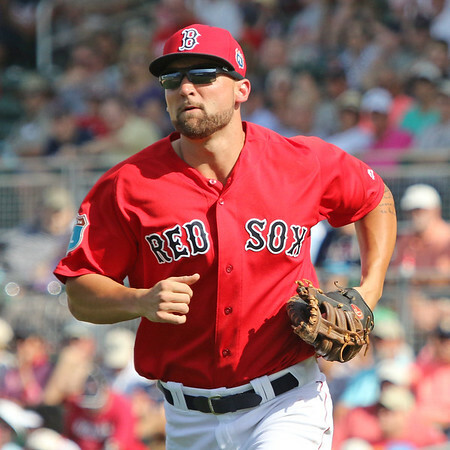 The Red Sox also reassigned first baseman Sam Travis (pictured), outfielder Ryan LaMarre, and right-handed pitcher Roman Mendez to minor league camp. There was some speculation that Owens would compete for a spot in the Red Sox' rotation with Eduardo Rodriguez expected to start the season on the disabled list. But a rocky spring — eight earned runs in 13 1/3 innings — squashed those thoughts and Owens will begin the year with the PawSox. Owens features a plus changeup that will keep him in the discussion for call-up this year after he saw inconsistent success in 11 starts with the Red Sox in 2015. Travis was a revelation at camp, belting two home runs and driving in a team-best 13 runs. Though his .536 average and 1.305 OPS came in a small sample size, the first baseman has hit at every level in the minors. Travis, the seventh-ranked prospect on SoxProspects.com, played the second half of 2015 with Double-A Portland, but will likely make the jump to the PawSox this year. Johnson, like Owens, received a taste of big-league action in 2015 but was knocked around for six earned runs in only 4 2/3 innings this spring. The lefty used his curveball to climb the prospect rankings and currently sits sixth on SoxProspects.com. His momentum was stunted by an arm injury in 2015 and a toe injury during camp. Though he could find himself in the Red Sox rotation in the future, Johnson will likely spend most of 2016 with the PawSox. Since coming to the Red Sox as part of the Jake Peavy deal in 2014, Hembree has bounced between the Red Sox and PawSox. Hembree features a hard fastball-slider combination out of the bullpen and saw success in Triple-A last season with a 2.27 ERA. LaMarre is a rangy outfielder that signed with the Red Sox last December. Though he amassed only five hits in 17 games, two were home runs. His bat lags behind his defense, as the 27-year-old has not posted an OPS over .708 at any minor league stop in the last four seasons. Mendez made his major league debut with the Rangers in 2014 after being signed by the Red Sox out of the Dominican Republic back in 2007. The hard-throwing righty could be a bullpen asset but struggles with command. He allowed 11 hits and six earned runs in five innings this spring. The moves trim the Red Sox roster to 39, including eight non-roster invitees.